Laura Bush said she has confidence in Palin. (CNN) - First Lady Laura Bush told CNN Wednesday Sarah Palin lacks experience in foreign policy, but quickly added the Alaska governor is "a very quick study." Asked by CNN's Zain Verjee if she thought Palin's resume included sufficient foreign policy experience, Bush said, "Of course she doesn't have that." "You know, that's not been her role," she continued, "But I think she is a very quick study, and fortunately John McCain does have that sort of experience." The McCain campaign has pointed to Palin's gubernatorial service as head of the Alaska National Guard, part of which is deployed in Iraq, as experience in foreign policy. But in the interview with CNN, Bush reiterated she has "a lot of confidence" in Palin. "She's got a lot of really good common sense, and I think that's very important," Bush said. "She also has executive experience from being a governor and a mayor, and I'm thrilled to have the chance to vote for Sarah Palin on the Republican ticket." Bush also said she agreed with those who have charged Palin is being treated unfairly because she is a woman. "I do think there's a little bit of that going on, and I think it's to be expected," she said. 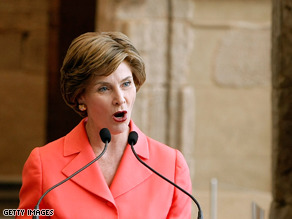 Laura Bush is in New York Wednesday promoting global literacy. She also met with political dissidents from around the world Tuesday, including a Burmese monk. now, if she could just do something about raising her husband's IQ.